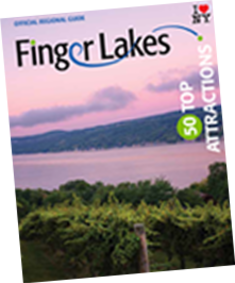 Movers, shakers, innovators and ideators have all called the Finger Lakes home, adding to our rich history and, often, to the history of the nation itself. You’ll find fascinating facts, pieces of the past, and persons of interest here. Every corner of this amazing region has a story to tell. We took flight with American aviator Glenn Curtiss (Glenn H. Curtiss Aviation Museum), watched as women took a stand (National Women’s Hall of Fame), delighted in the stories of Huckleberry Finn as his character came to life (Mark Twain’s Study), even laid claimed to the first chapter of the American Red Cross (Clara Barton House, Chapter #1). History lives on in places like the Genesee Country Village & Museum, the largest collection of historic buildings in the Northeast, with events and costumed re-enactors year-round. Or at Ganondagan State Historic Site, where the location of the largest, most vital 17th-century Seneca towns once stood. You can still tour the full-sized bark replica longhouse or wander down marked trails on the 500+ acres of land at this site. Even our names evoke the area’s history. The two largest lakes in the region – Seneca and Cayuga – are named for two tribes in the Iroquois Nation, as are many of the area’s towns, villages, and historic sites. We invite you to explore our stops, seek out stories, and in this case, don’t be afraid to live in the past.